Another key part of this commercial is the new Honda Accord. The only member of the cast to have their own Winnebago. Getting ready for it's close up. To film the Accord on dirt roads in the desert requires some specialised kit. 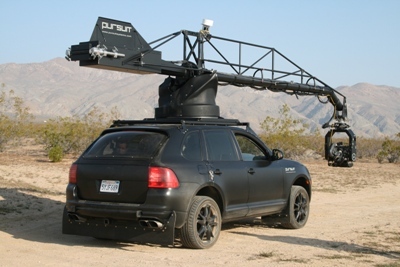 In order to track the car as it drives through the brush, a camera is mounted to the robotic arm on the pursuit vehicle. The cameraman is able to control all elements from inside the car using a joystick and monitor. This sophisticated technology allows us to get up close to the Accord at speed but maintaining a relatively stable camera shot. What brand is the pursuit vehicle? The pursuit car is a souped up Porsche Cayenne. 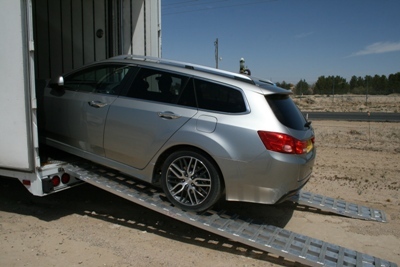 It is specialy designed for chasing fast cars over rough terrain. Lacks some of the creature comforts of your average Cayenne but instead you get a million pounds worth of camera gear rigged to the top. Only 2 in the world so there is a bit of wating list. And second: Is that really an Euro spec Accord in the States? If so please tell me you will sell it on Crigslist because the Acura TSX version we have here has an awful grille and no estate version! Nice one folks... really well done. We tuned in specifically and really enjoyed it. Well done to the creative team and the jumpers... as well as Honda. is there a list of names of the jumpers anywhere?